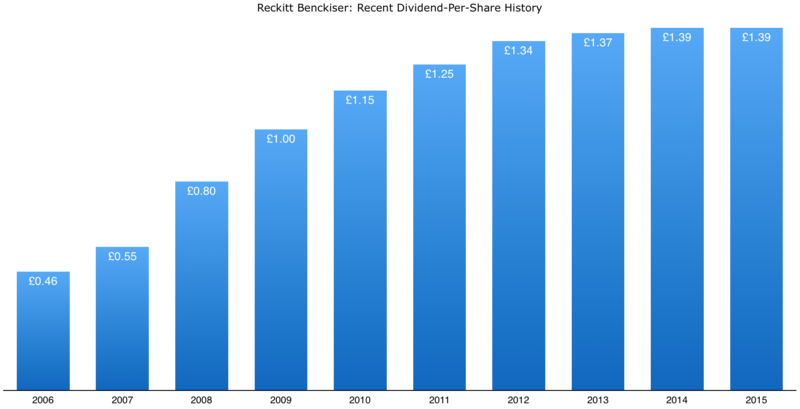 U.K. based investors should know all about consumer defensive company Reckitt Benckiser (LON: RB. ), or just RB now after the name change, but I’m not altogether sure how well known the company is to North American investors. The usual high quality suspects like Johnson & Johnson, Unilever and Procter & Gamble grab most of the attention, even though Reckitt is definitely on the same level in terms of quality, and maybe even more so as I will go into below. That said I was quite surprised to see just how few articles covered the stock on a comprehensive site like Seeking Alpha. Whilst RB’s market cap, at $70bn, is a fair bit smaller than the popular mega-caps mentioned above, it is still large enough to warrant a much larger following. Even more so given how profitable the business is. Regardless of the group’s visibility, U.S. based consumers will definitely recognize some of their products. Dettol, Durex, Air Wick, Lysol, Nurofen and Vanish are just a selection of the power brands that fall under the umbrella of Reckitt, and I’d imagine most people in the 200 countries that the company have sales in have heard of at least one or two of those names. If not then we can add Clearasil, Veet, Gaviscon and Cilit Bang to the list. There are more, though those are the ones that are probably most recognizable. The great thing about diversified brands like these is that they litter the homes of nearly everyone in the countries where they are available. It’s a similar story with Procter & Gamble and Unilever, where you actually end up quite surprised just how many products are lying around your home at any given point. Even though we might not necessarily be aware of it, these companies have a grip on our everyday lives. The end result is that they are able to maintain a degree of pricing power, economies of scale advantage and spend huge profits to run the marketing campaigns that keep it that way. Take Nurofen for example. The painkiller itself probably contains nothing special by way of formulation – it’s just regular ibuprofen. What is special though is that a pack of Nurofen next to a grey box marked “painkillers” will sell out first. Not only that but it would do so even with a nice markup on the price. It’s something I’ve repeated often in many of my articles so far, but branding is everything. I liken Reckitt to the more well known (at least in the States) consumer defensive Church & Dwight in that they both have similarly superb free cash flow generation. Church & Dwight regularly converts something like 80%+ of its cash from operations into free cash flow, which can then go into things we shareholders appreciate like dividends and share buybacks. Reckitt Benckiser is of that same quality; in the last two years the company converted over 90% of cash flow into owners’ earnings. You can go back longer term and see the same effect as the underlying business is a cash machine. The underlying business is extremely profitable, with returns on capital regularly exceeding 25%. There are very few consumer stocks that have comparable business economics. The other benefit of course is that it allows Reckitt to distribute huge amounts of its cash flow back into shareholder hands without degrading the future earnings power of the business. In fiscal year 2015 for example the company spent close to 100% of free cash flow on dividends and stock buybacks. If you track the returns over a slightly longer period you can see the point very clearly. At the start of 2006 for example the shares were trading on the market for about £18 per-share, which at the time equated to a market cap of £13 billion. In the following decade the company have already returned about 60% (£7.5bn) of that figure in the form of cash dividends, which equates to about £10.70 in per-share terms. If you hold long term then stocks like Reckitt Benckiser will mint cash. It comes back to the point above about the returns on capital, the company is so extraordinarily profitable that over reasonable time frames the shareholder returns are going to be very significant. Management is committed to paying out 50% of net income as dividends, which as stated above is easily achievable given how secure the earnings of the company are. What it does mean though is that RB isn’t really a typical dividend growth stock, which is why you see them “freezing” the dividend even though the pay-out ratio is nice and healthy. For income investors looking for clockwork dividend growth then this may not appeal. That said there are two additional points to consider on this front. The first is that the sheer quality of the earnings mean RB will be the gift that keeps on giving with respect to shareholder returns. The annual compound dividend growth rate over the past ten years is 11.6% for example, the price returns over the same time period are 12.6%. Excluding the added effects of any kind of DRIP program then you would be looking at total returns of about 300% over the last decade. That works out to 14.6% on a compounded annual basis. The second point is that as a U.K. listed stock withholding taxes aren’t an issue, whether you hold directly via the LSE listing or the plc ADRs that trade in New York. It’s something that cropped up a lot in my Seeking Alpha pieces on similarly high quality European stocks Nestlé and L’Oréal, but fortunately there are no such issues with U.K. listed shares. One of the consequences of having such strong earnings quality is that Reckitt goes into the category of stocks that are pretty much perpetually overvalued. At least that’s how they appear in any case. The flip-side though is that when you have a company that can deliver £1.7bn in net income on tangible capital of £3.9bn, then you can see not only why the stock trades at a premium but also how it’s able to consistently deliver large shareholder returns in spite of that. Not only that, but most of the tangible capital consists of cash and receivables, to the point where they can spew out after-tax profits of well over 100% the value of the actual plants and equipment used to generate their products. It’s worth stressing again that there are really only a small number of stocks that have a history of doing that over long time frames. With that in mind it’s not that surprising then that even at a price to earnings multiple of 22 a decade ago the shares have still managed to produce total returns of nearly 15% compounded annually over that period. That’s also excluding the added compounding effects of reinvesting the roughly £10.70 per-share that would have been received in dividend payments too. The shares currently trade in the market for in the region of 26x prior year earnings. There are some foreign exchange headwinds that cloud that figure slightly but even so it appears to look quite expensive. RB though is one of those companies that, over a sufficiently long investing time frame, has such stable and high quality earnings power that there’s a great chance they will deliver very attractive shareholder returns going forward. At the very least it should be on the radars of any income quality hunters out there.